Discussion in 'Weather' started by Wardy, Aug 27, 2018. My last outlook of the season for long term prospects in North America, complete with a verification for this season's seasonal forecast. Mammoth picked up another 30-odd to 40-odd inches of snow in the last 48 hours. ...and that’s not even the start of the impending systems of this week. Mammoth Lakes, above 8000ft are expecting 2-5 feet of new snow. It's already dropping heavy snow tonight. 12-26" storm total for Mammoth mountain now. Still flogging it down on the cams ATM. Warm system, with some good rainfall in the lower reaches of the resort though. With the deepest snowpack in the country, Mammoth has announced resort will remain open until 4th July - big call 4.5 months out. Great season for so many areas. Boreal Mountain - 64" (5.3 feet) in 48 hours. CA is breaking records this February. Gee you'd think they could have used a better photo to represent it, I can't even tell what that first one is! I think there comes a point where it genuinely is a whiteout, to shoot freakishly deep snowfalls. No doubt the coming days will reveal more. FourSquare04 and POW_hungry like this. Snowy Sierras . Click to enlarge. DiscoStuAU, Jellybeans1000 and POW_hungry like this. Even the Mendocino Nat Forest peaks look skiable, not to mention the coverage in the North East of the State. DidSurfNowSki and Zeroz like this. 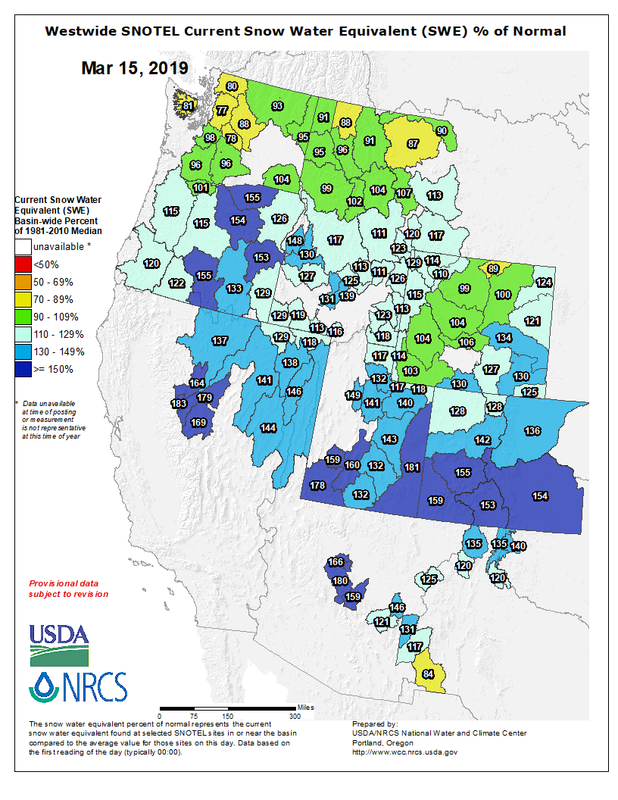 March 2019 snowpack update from opensnow. It's worth mentioning that most hills in the and Canada don't require 100% of average snowfall to deliver great conditions. I've been there in lean years in early season and had a great time. I plan to be in the US in Feb 2020 so I'm looking forward to tracking the snowfall from November to January. Going to Banff and skiing some of the resorts around there from the 23rd March for 8-9 days. Any updates on the forecast? Looking impossibly warm there at the moment, lots of freeze/thaw or should it be OK? Will mainly be at Sunshine. 27th is slip-sliding away with all the action culminating West and flatting our for the SE. Nonetheless, still looking ok for rainfall through Vic. Feels like a Monday, fugg et. Somewhere on this forum is a thread about Orville Dam almost failing. Well, they've rebuilt the main spillway and it just got a workout. Mine's not done yet. Will be interlodge for Alta tomorrow morning 6:30-8:00am, with the canyon road closing at 5:30am. 8 inches in the first wave of the storm today, more than predicted The total forecast looking good for the next two days. Temperatures will stay cold for a few days so won't be back to spring skiing too soon. absentskier, Gregah and DidSurfNowSki like this. I just skied Tahoe areas and Whistler (WB) in last 2 weeks. Late season opportunistic April trip. Squaw Valley and Kirkwood still have a 10ft base or something huge. Good skiing and will be open until July. It's getting a bit warm and some of the steep stuff has been filled in given the stupid amounts of snow this season. Some people (like me!) slag WB for weather/wet snow/too Aus. But 10m this season, 50cm last 2 weeks (after dry March) and was great skiing. Been 15 yrs since I skied WB and I forgot how much variety and fun challenging terrain they have. North Flute Chutes, Horseshoe, had hefty cornices for jumping off, snowy bowls, plus Spankys. Worth a late season visit.